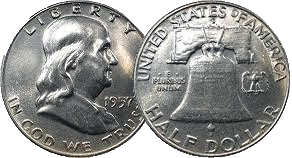 The Franklin half dollar coin was produced by the United States Mint from 1948 to 1963. The fifty-cent piece pictures a bust of Benjamin Franklin on the obverse and the Liberty Bell on the reverse. A small eagle was placed to the right of the bell to fulfill the legal requirement that half dollars depict the figure of an eagle. Produced in 90 percent silver with a reeded edge, the Franklin Half Dollar Coin was struck at the Philadelphia, Denver, and San Francisco mints.